As President and CEO, of Desirée Patno, Inc., Desirée Patno is known for her extensive housing and real estate knowledge spanning relocation services for high-profile individuals and companies to connecting discerning luxury home sellers with qualified buyers to offering expert advice on interior decorating. 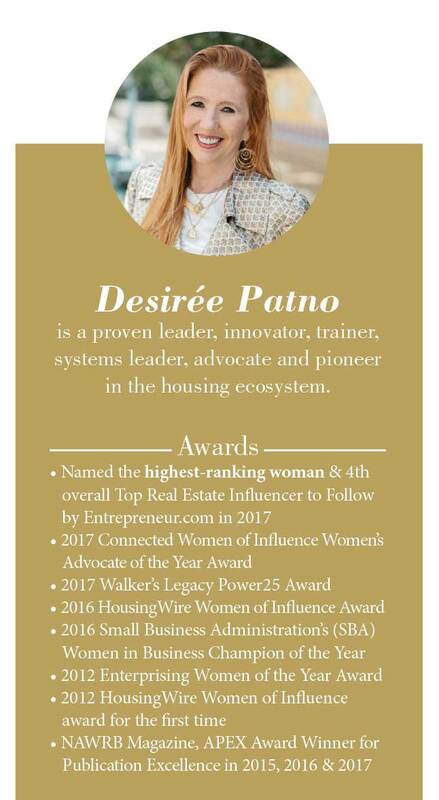 Named as the highest ranking woman and fourth overall Top Real Estate Influencer to Follow by Entreprenuer.com in 2017, Desirée is a sought after public speaker, radio, podcast and talk show guest, and industry thought leader invited to speak at numerous conferences and conventions throughout the year. She leads women in the industry through Women in the Housing & Real Estate Ecosystem (NAWRB), which she founded to advance women and women-owned businesses, providing women the tools for economic security, stability and sanctuary. Desirée and her team come with a comprehensive knowledge base, personal and government connections quickly helping buyers and sellers, explore, research and finalize the perfect home purchase. Her above-board integrity and standards ensures the most smooth and timely transaction possible. Regardless of whether you are looking for a private suburban mansion, or a smart home with advanced amenities in the heart of the city, Desirée Patno Enterprises firm can fulfill your distinguished sensibilities and help make your dreams possible. Please contact Desirée Patno Enterprises, Inc. to begin the search for your tomorrow, today.